As set out above, our estimate represents an average figure for a labour force of constant strength employed with maximal efficiency and at a steady rate for the span of a hundred years. This certainly must be regarded as a gross simplification but it should be remembered that it is a minimum figure, since fluctuations in employment would cause an increase and not a decrease in the aggregate number of workers. For reasons to be discussed later, we may suspect that the actual labour force was less than 70,000 to begin with, increased to more than this number in the middle of the period, and was probably run down fairly rapidly at its end. Considering these large numbers, we now begin to see why the building period of the Meidum pyramid and the Bent Pyramid had to overlap so heavily, and why the old concept of consecutive building periods under successive pharaohs was quite impossible. While it is true that, since the work was carried out during the inundation period, the drain on food production in the Pyramid Age was not serious, its general economic effect on the country must have been profound. We can best illustrate the pattern of work by a simple and highly idealised diagram. Let us consider first the accepted idea that on his accession to the throne the pharaoh started on the construction of his pyramid. He then would make use of the maximum available labour force in order to ensure that the monument should be completed as speedily as possible. This means that the maximum number of workers available for the project will have been run up as rapidly as possible and they would all be employed season after season for ten or twenty years. Throughout this time they were busy quarrying, transporting and placing the blocks. Then, however, the stage was reached when the pyramid had grown so high that access to the working area was becoming restricted and also slow. This means that the working force had to be run down during the next seasons until the pyramid was finished and all building activity ceased. Nothing now happened until the next pharaoh started his reign, when the same process had to be gone through all over again. Since there would have been an interval between the building periods and also a gradual run-down of the force at the end of each period, our original calculation of the labour force is too low and about 150,0 workers had to be employed seasonally for, say, fifteen years, after which they would be idle for a similar period. It does not require much imagination to see that this type of employment pattern is utterly unrealistic and economically not feasible. life of everybody to be reversed to the original pattern after a span of twenty years. No economy in the world, not even that of ancient Egypt, could have survived such a switching on and off of this immense working force. In other words, consecutive construction of large pyramids was simply not practicable. Going back to our diagram we see that a critical stage for the maintenance of the working force was reached when limitation of access to the pyramid demanded its reduction. At this stage there was only one way out of the economic dilemma; the surplus workers had to be shifted to the start of the next pyramid. From then on not one but two pyramids were under construction, as indeed we have discovered in the simultaneous work on the Meidum and Bent Pyramids. It is also clear that pyramid building had to become essentially independent of the length of a pharaoh’s reign since it had to continue unabated in order to maintain the employment pattern once it had been instituted. With construction periods running heavily into each other and the total labour force probably increasing all the time, the fact that there exist more large pyramids in the Fourth Dynasty than pharaohs who could be buried in them becomes understandable. Since the average reigns of Snofru, Khufu and Khafre seem each to have been about a quarter of a century, it is not surprising that they ended up with four, or possibly five, large pyramids. The difficulty of gearing the construction of a pyramid to the length of a prospective reign had already occurred to the great German Egyptologist, Richard Lepsius, in the middle of the nineteenth century. How, he asked, could a pharaoh provide a completed or nearly completed monument at the time of his death when he could not possibly foresee how long he still had to live? Lepsius’ answer was his famous accretion theory, according to which the king would start with a tomb chamber over which he would then erect a gradually increasing pyramid. Its final size would therefore be determined by the length of his reign. When it was eventually discovered that the layout of the large pyramids had been determined at the outset, Lepsius’ theory had to be discarded. However, it appears that by then his critics had forgotten the real reason for Lepsius’s proposal and the problem of correlating pyramid construction and length of reign remained unsolved. The suggestion that the successor would finish the previous king’s monument turns out to be a semantic argument. 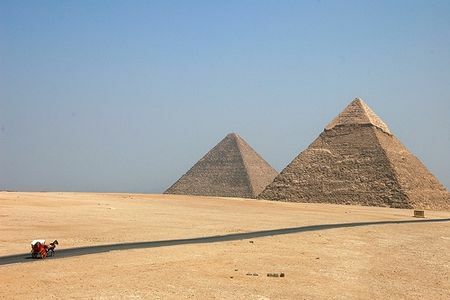 If a pharaoh died halfway through the completion of his monument, his successor would have had to finish a sizable structure when starting on his own pyramid, which would be indistinguishable from the pattern of continuous construction outlined above.